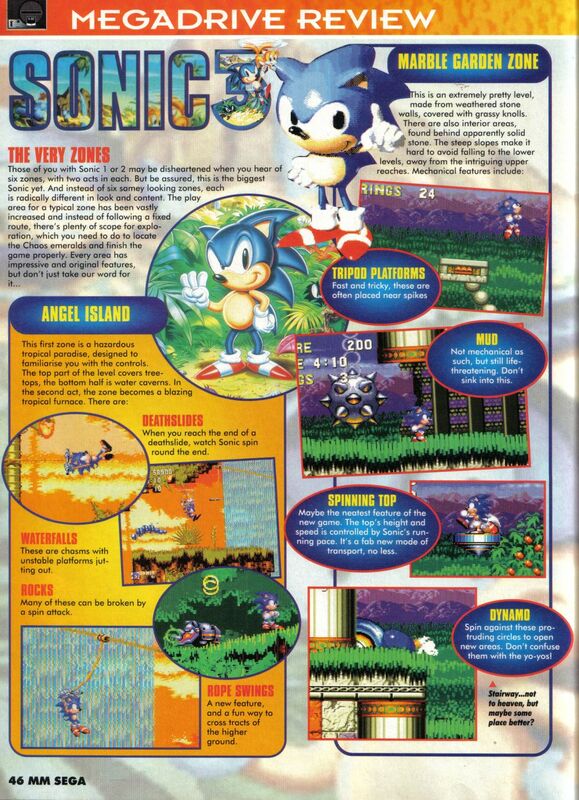 This is from the Cheats section of the 5th of August issue of Sonic The Comic. 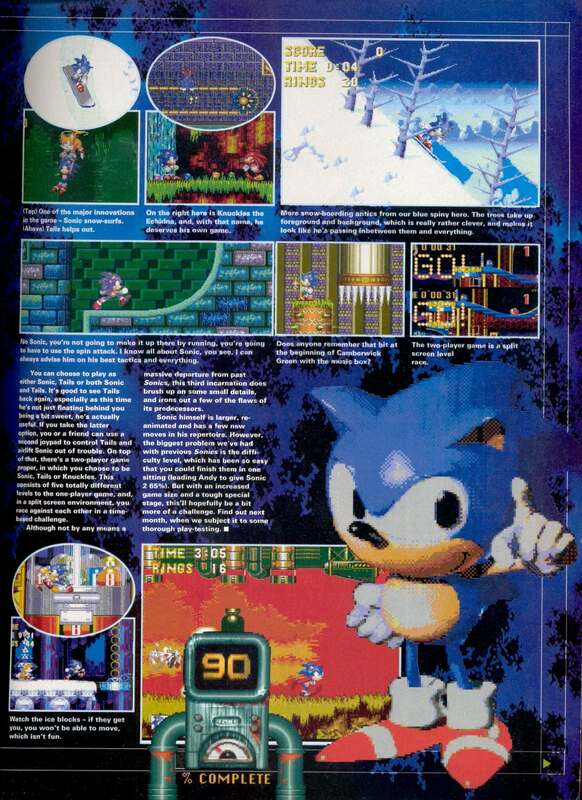 It includes a zoomed in image of Sonic running down the Ice caps. 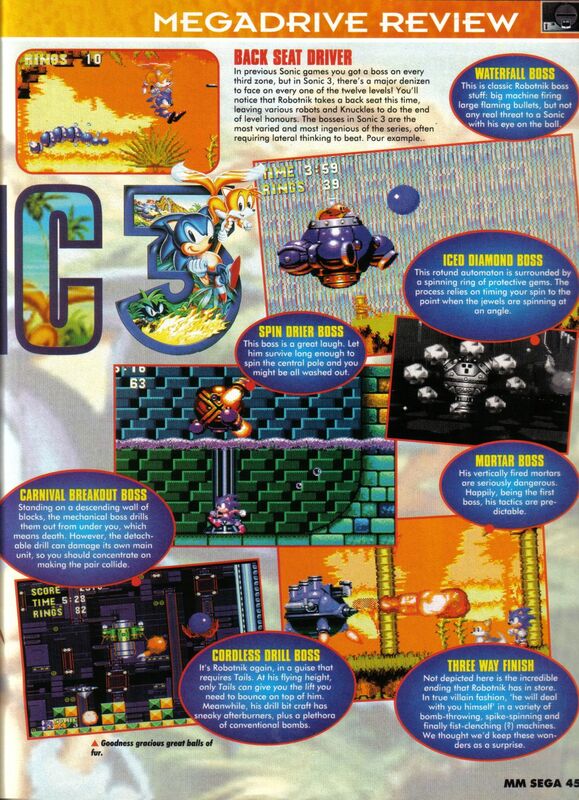 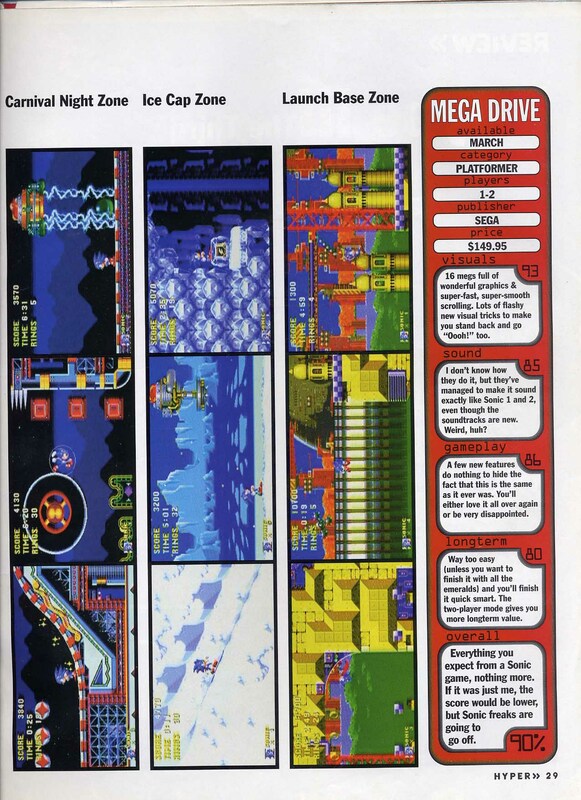 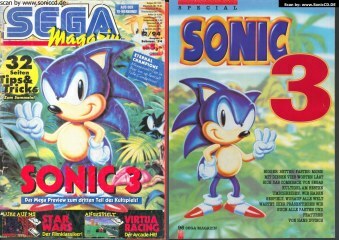 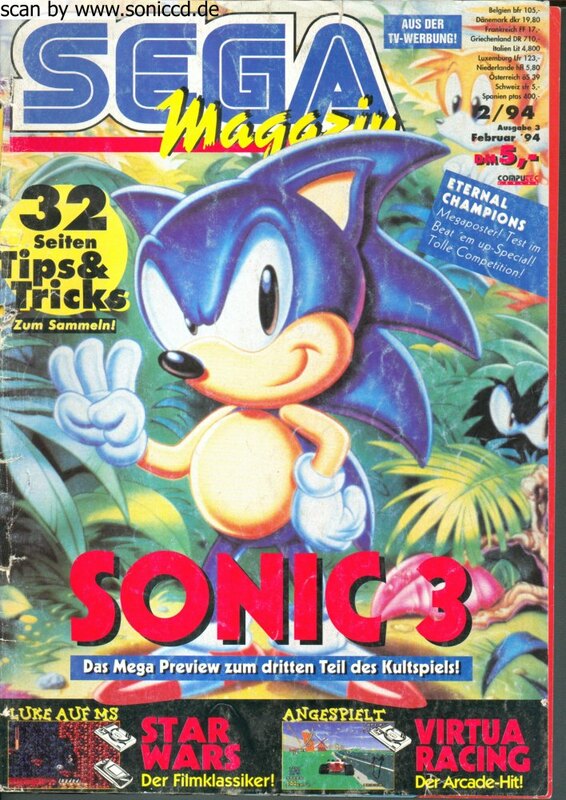 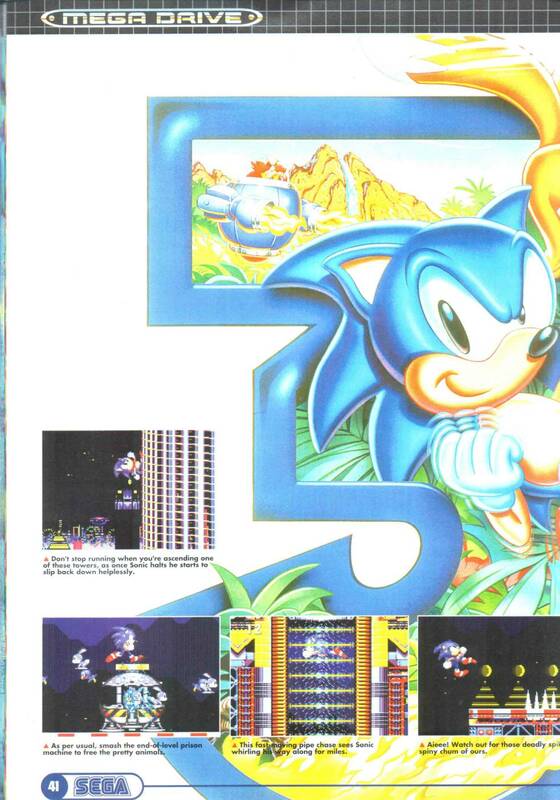 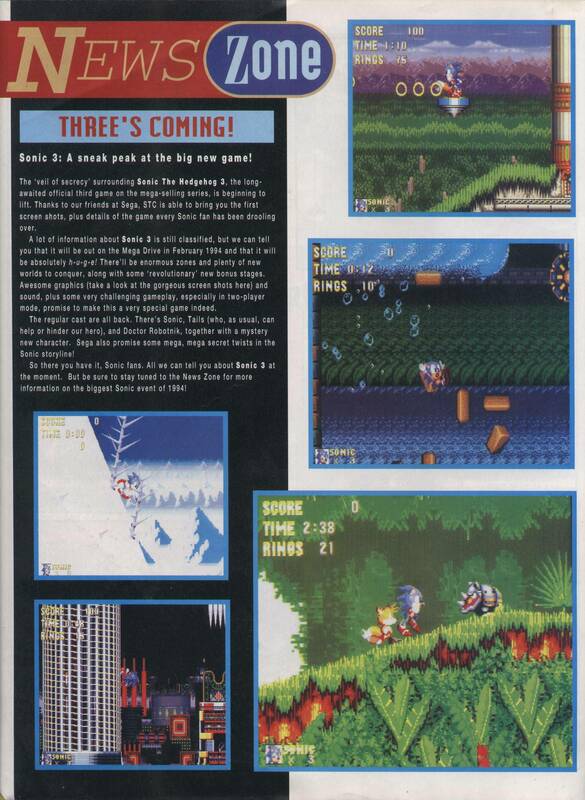 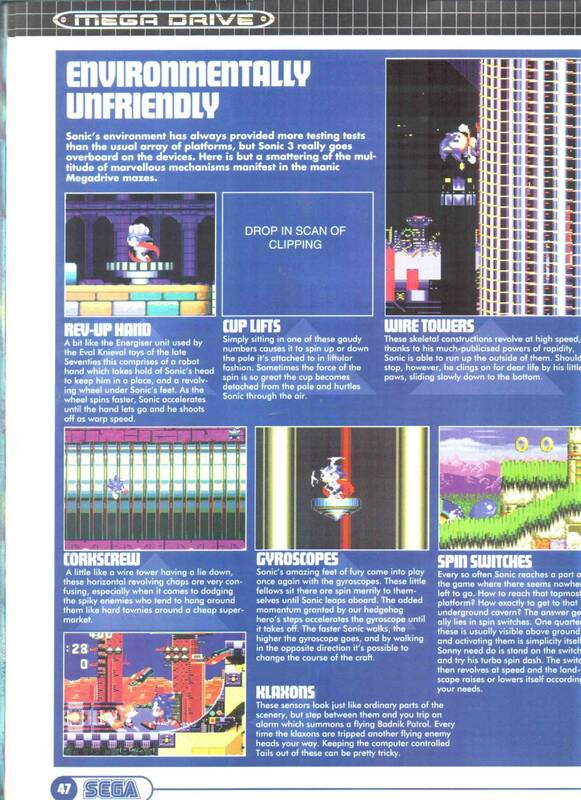 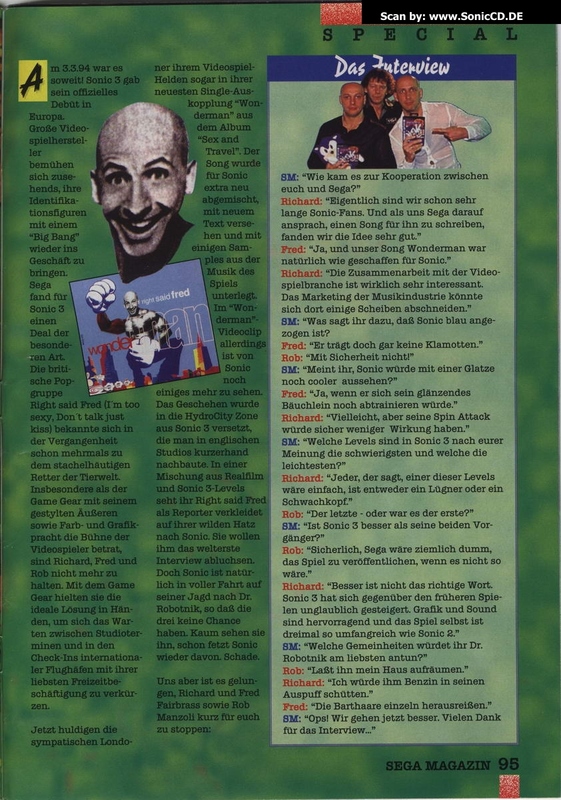 Here is a Sonic 3 preview by German magazine 'SEGA Magazin' in their Feburary '94 Issue. 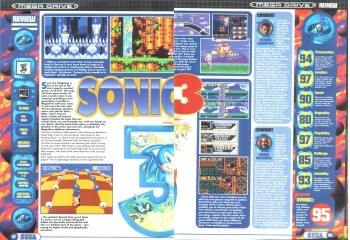 It includes a lot of early images of Sonic 3, usually including Sonic 2 sprites. 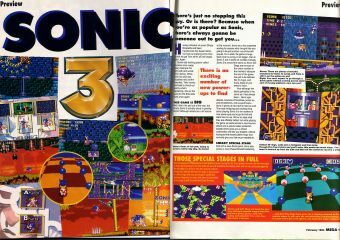 It even mentions that there will be a Part II of Sonic 3 [which ended up being Sonic & Knuckles], so maybe it was intended to be 2 games earlier in production? 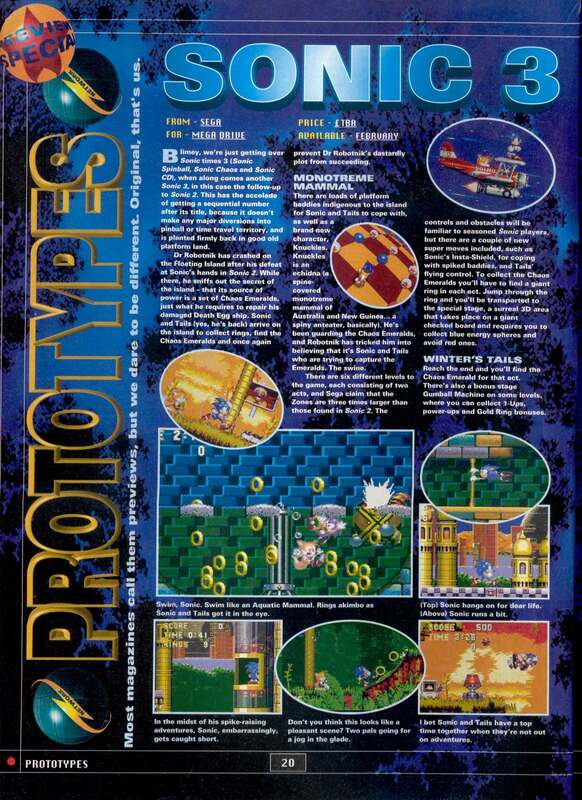 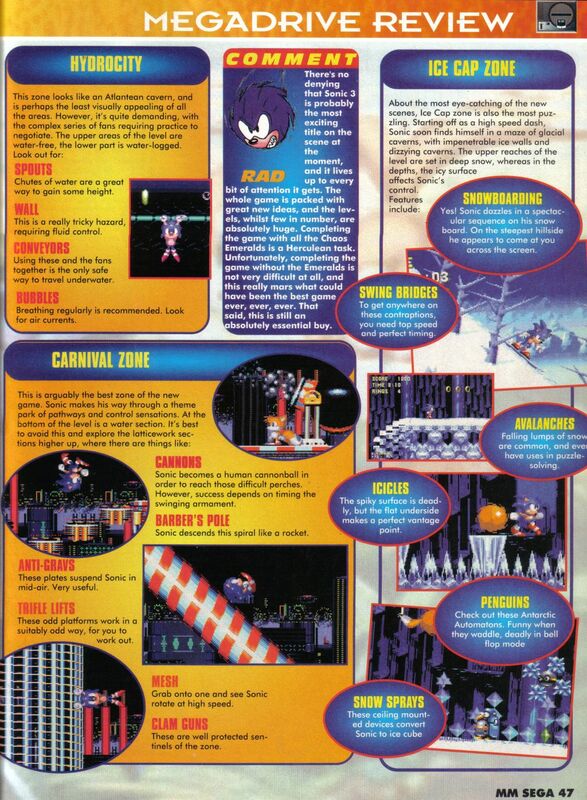 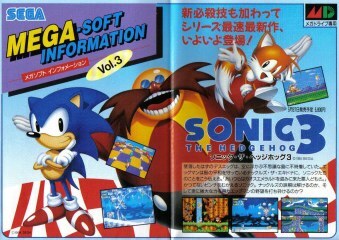 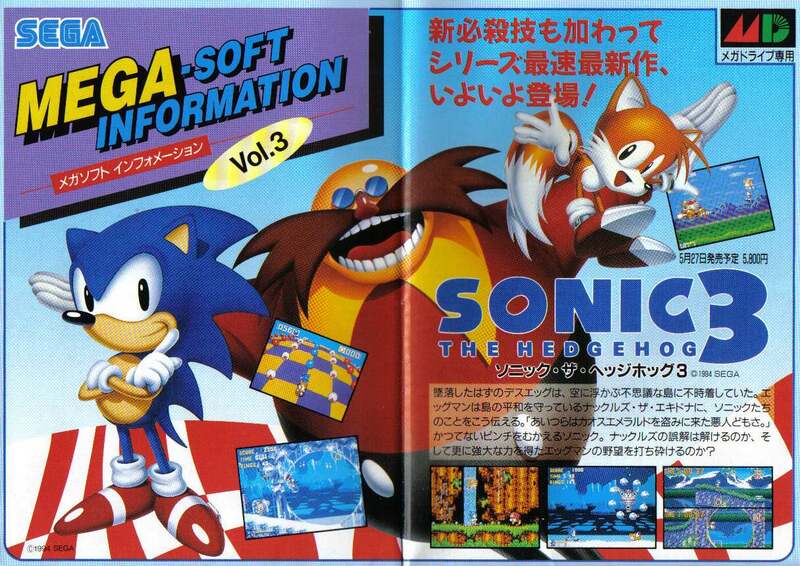 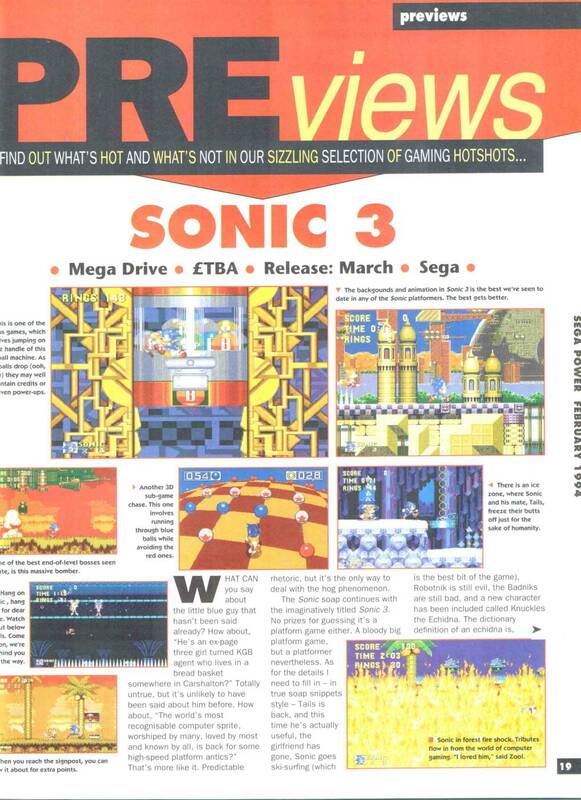 MEGA Magazine did a preview of Sonic 3 back in Feburary of '94, based on a near final build. 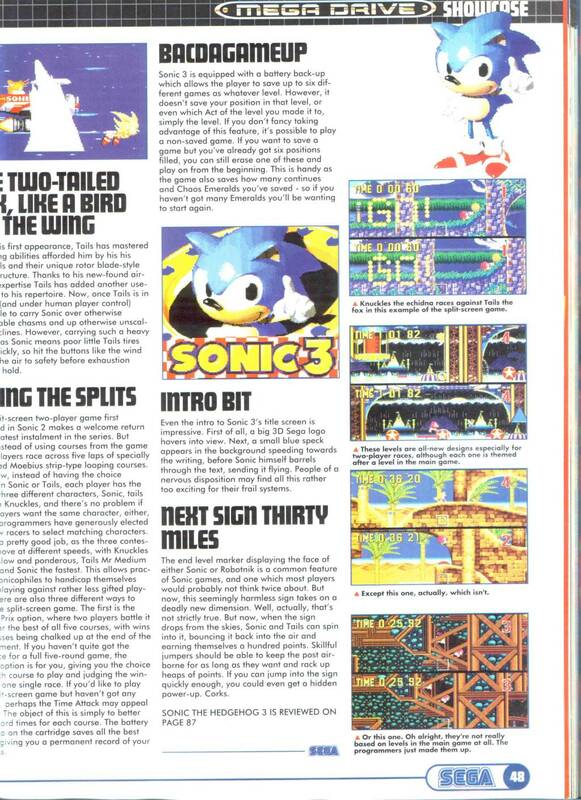 GameMaster Issue 14 had a nice preview of a 90% complete build of Sonic 3, nothing particularly interesting screenshot wise. 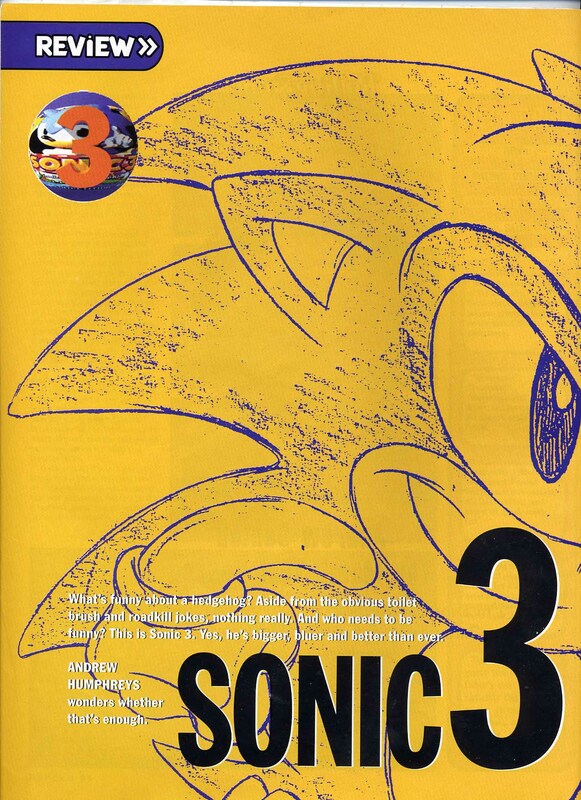 In the December 25th 1993 Issue of Sonic The Comic there was a preview of Sonic 3. 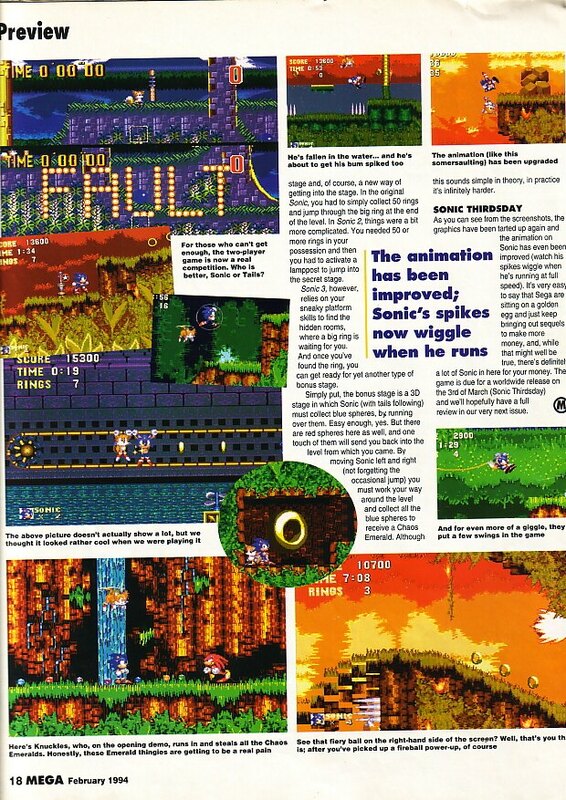 This article includes a lot of early screen grabs, all of them with Sonic 2 sprites! 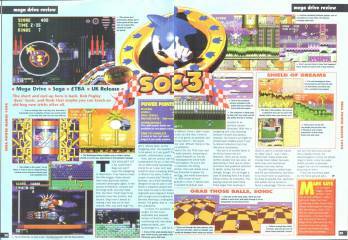 SEGA Power Magazine had this 2 page preview of Sonic 3 back in Feb '94. 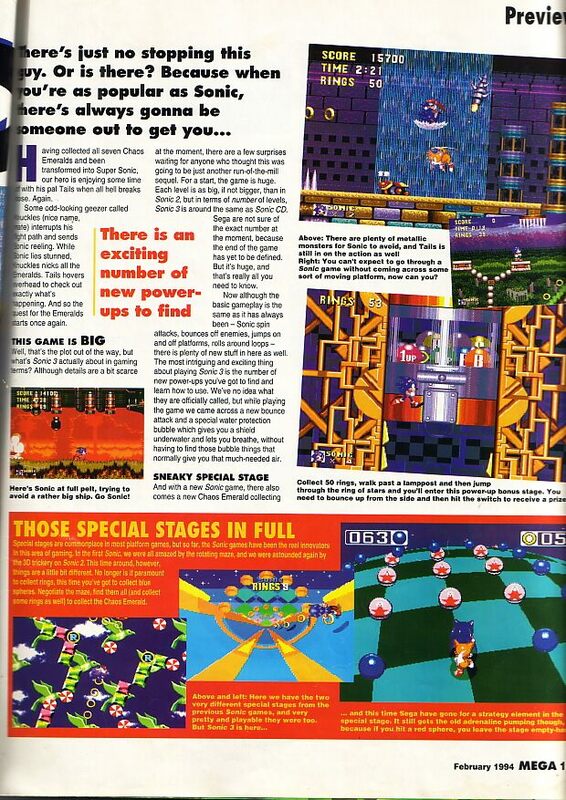 Despite the 2 pages, it really doesn't say a hell of a lot. 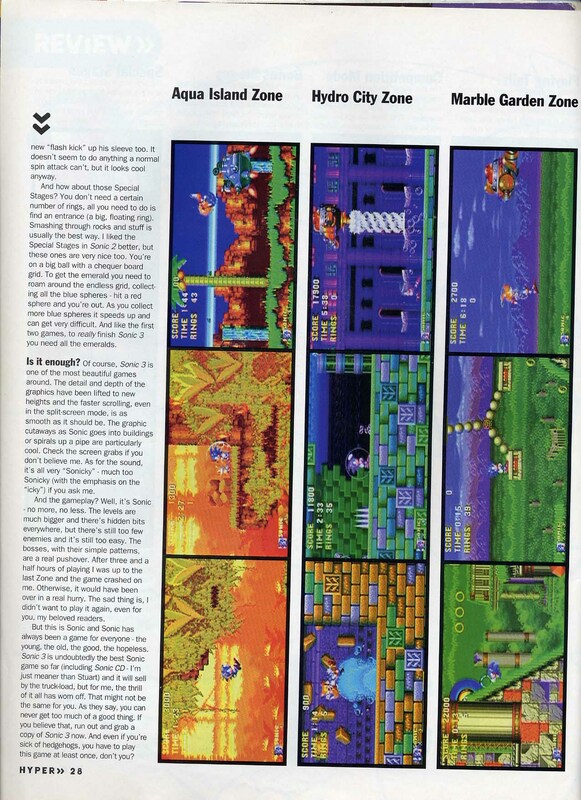 Sounds like a lot of game journalism back then. SEGA Magazine had a HUGE Showcase in their second issue back in Feburary '94. 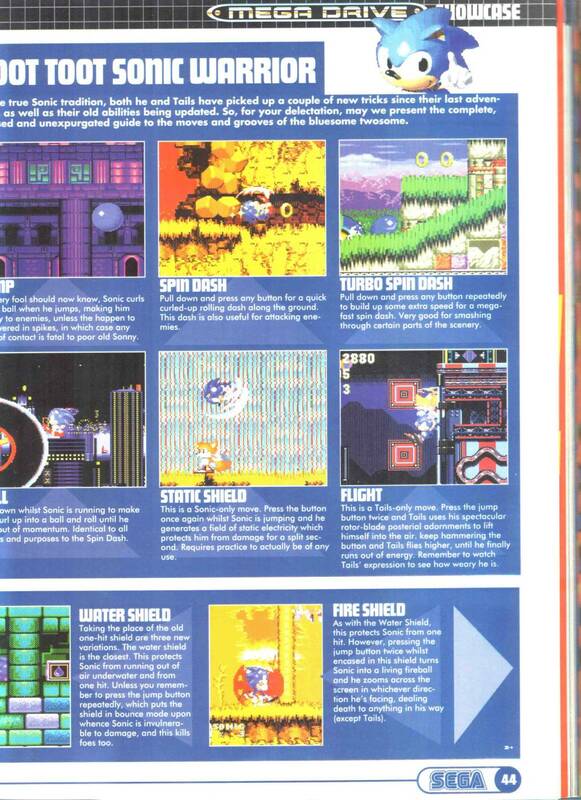 8 pages dedicated to the game, detailing shields and levels. 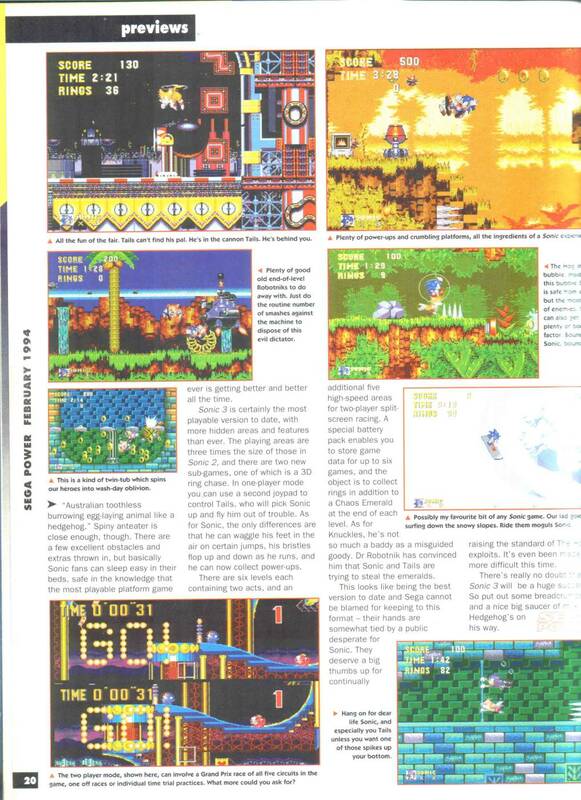 They also reviewd the game in the same issue [further below]. 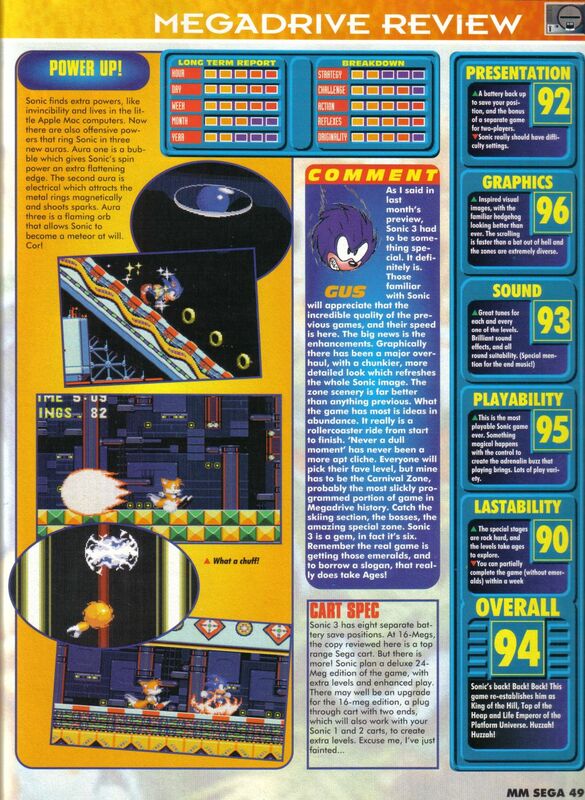 Later in the issue, they reviewed the game, giving it 95%. 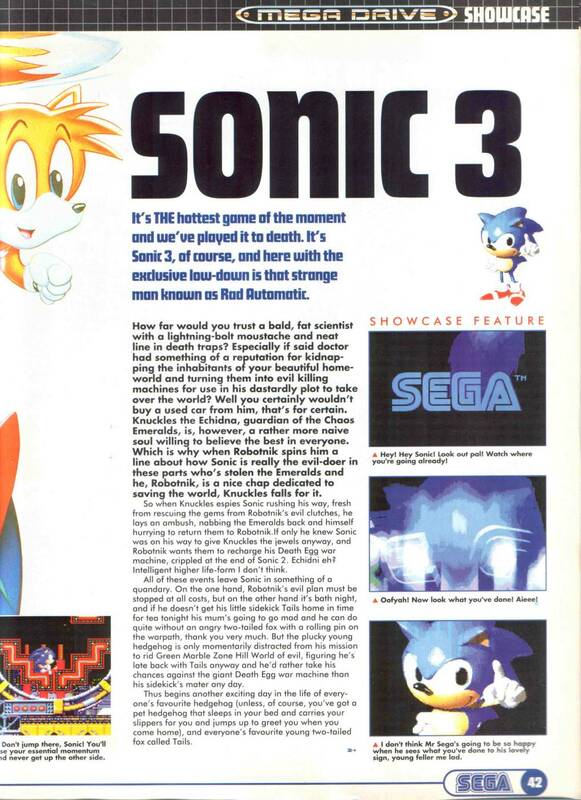 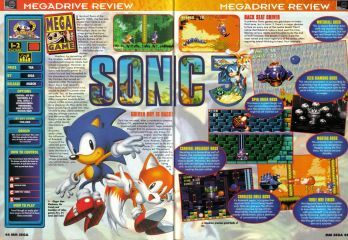 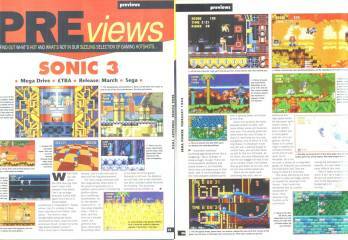 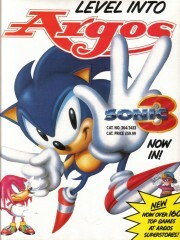 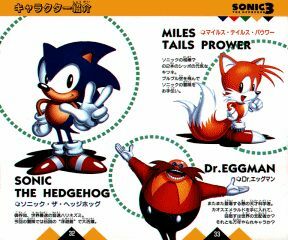 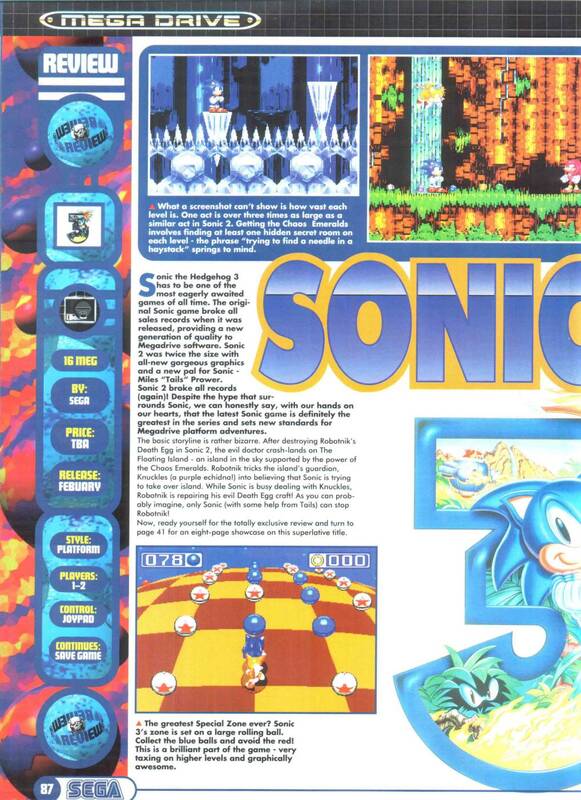 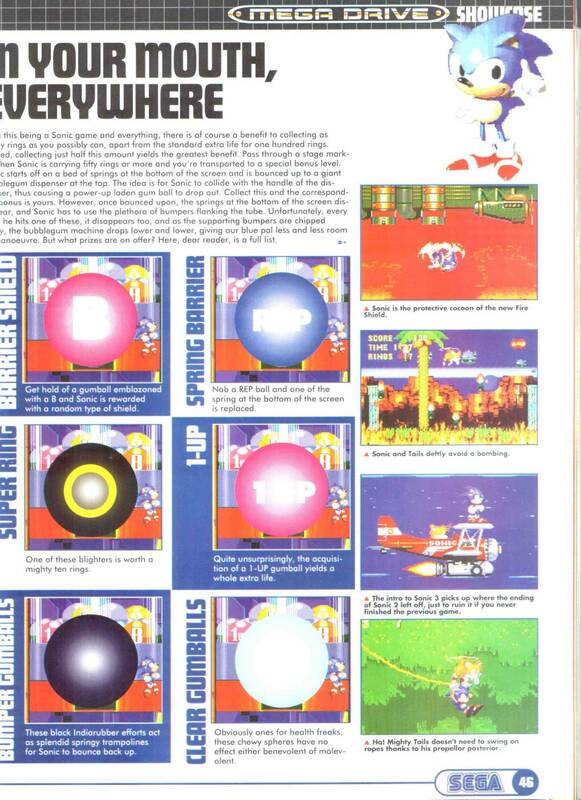 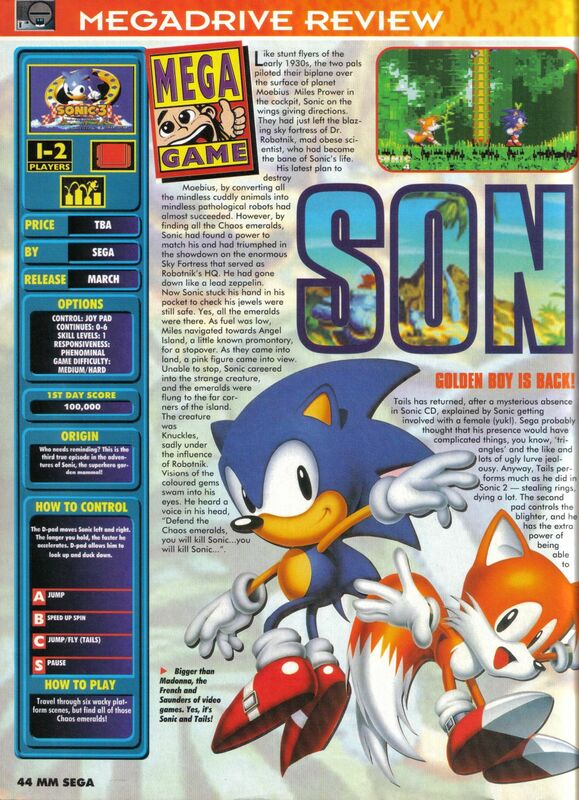 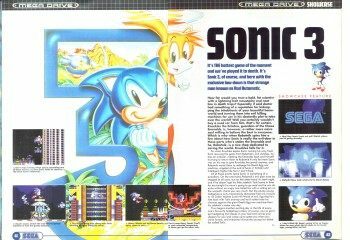 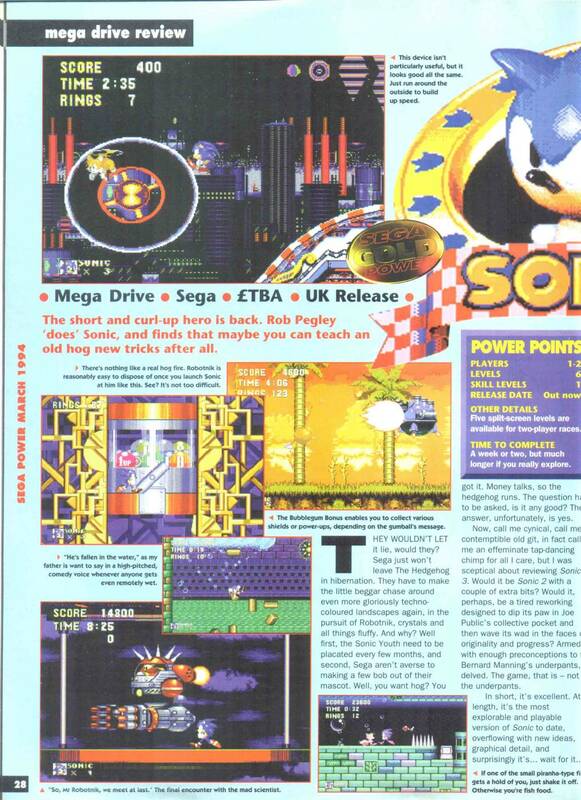 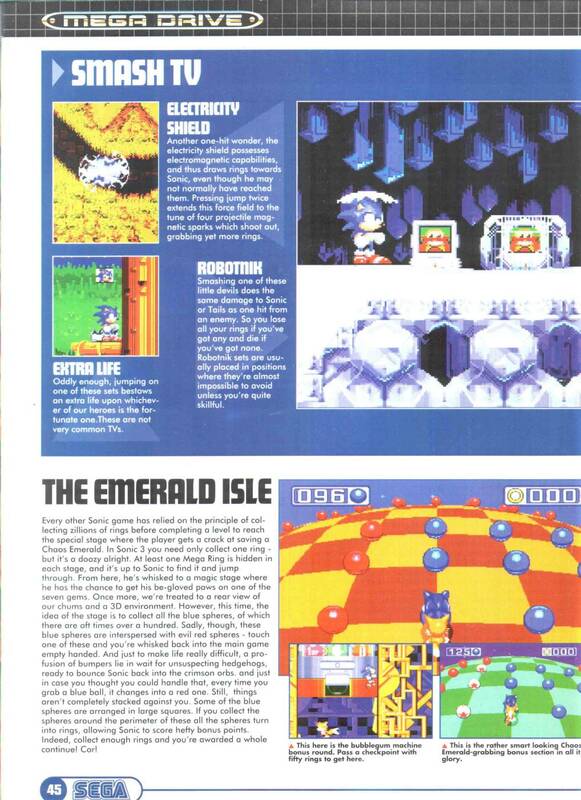 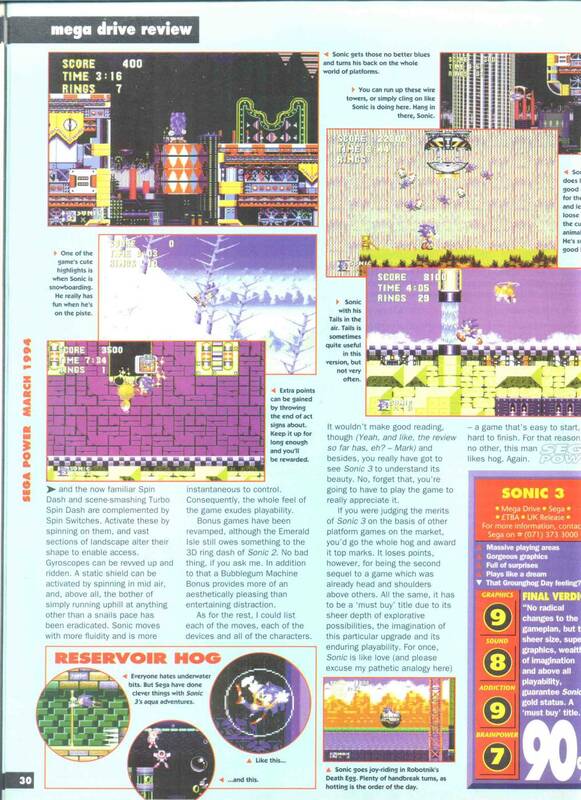 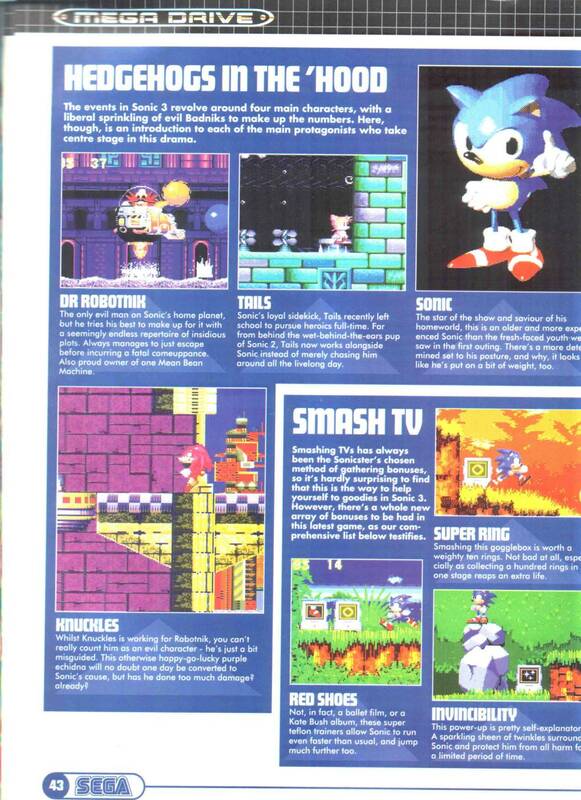 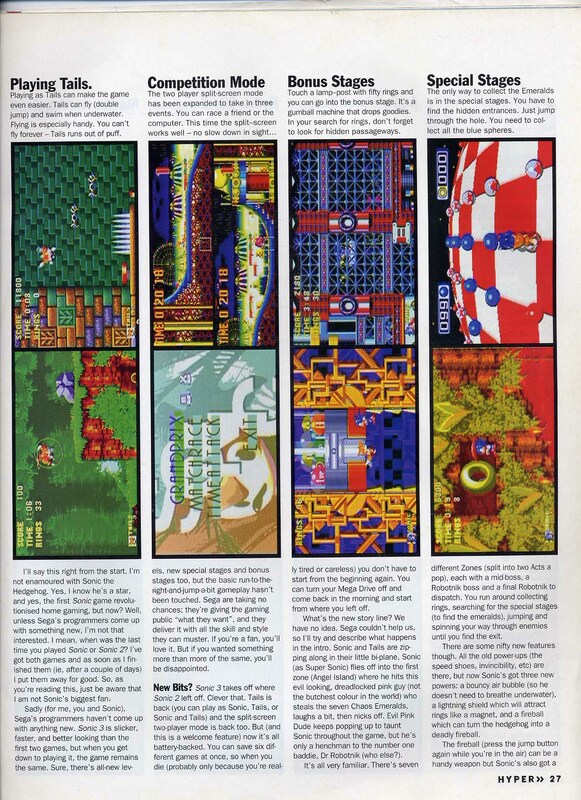 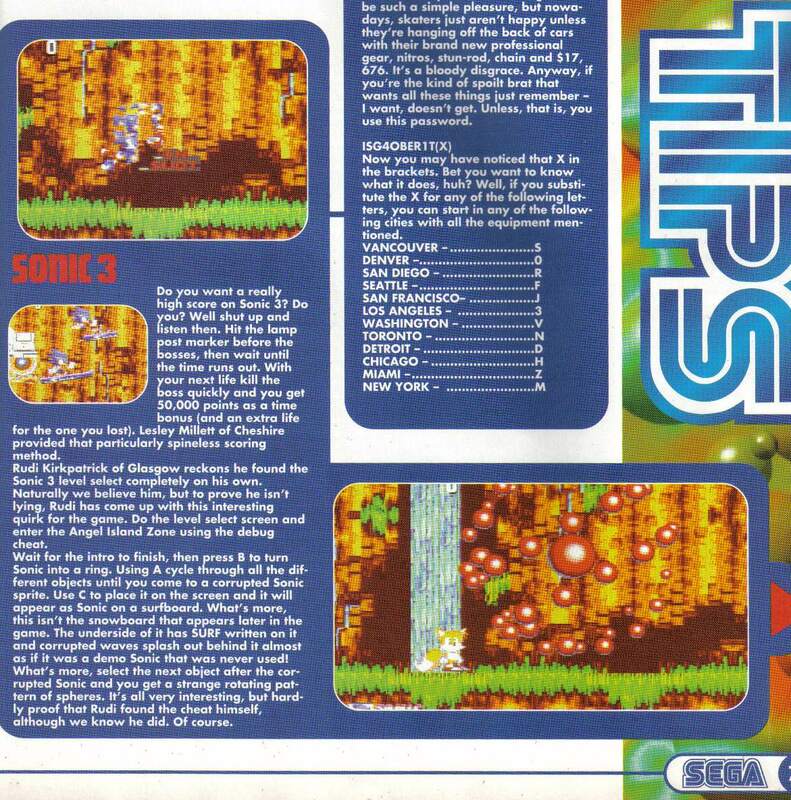 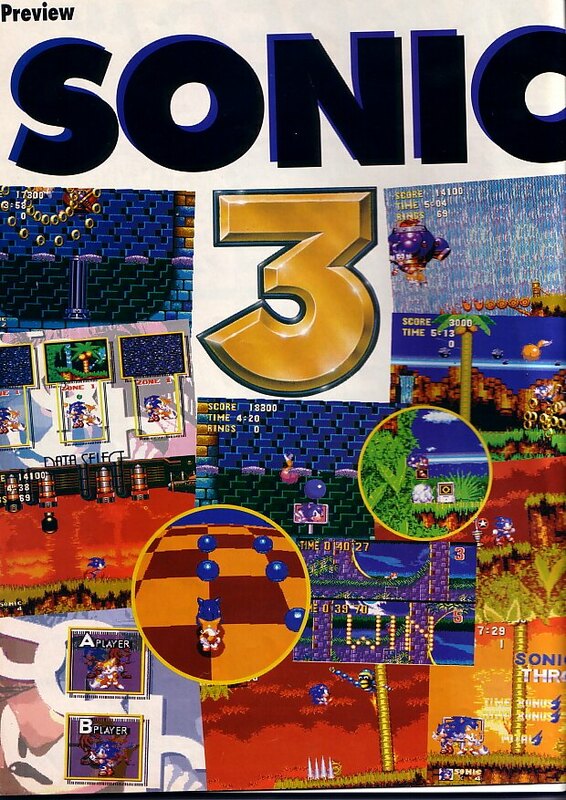 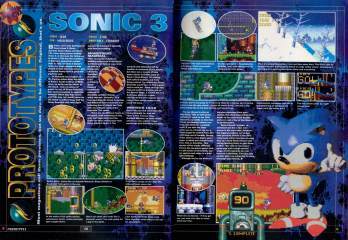 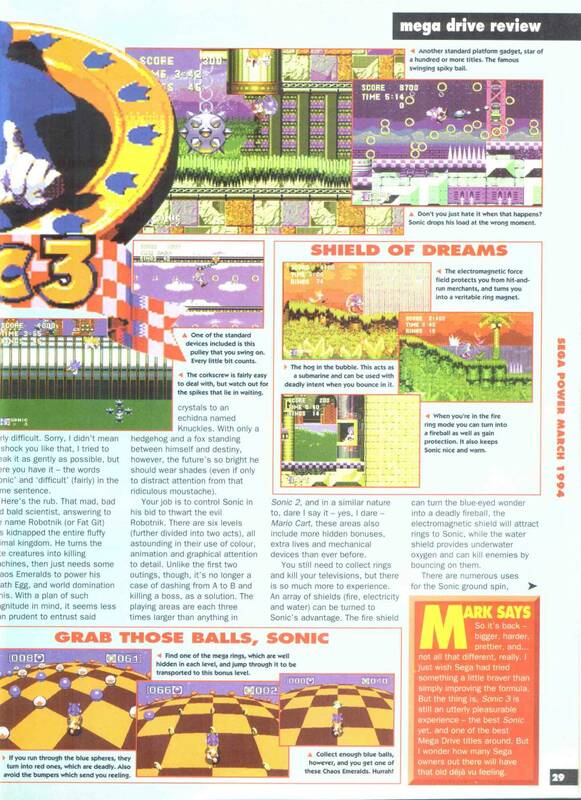 A Month after the preview, Sonic 3 was reviewed by SEGA Power Magazine. 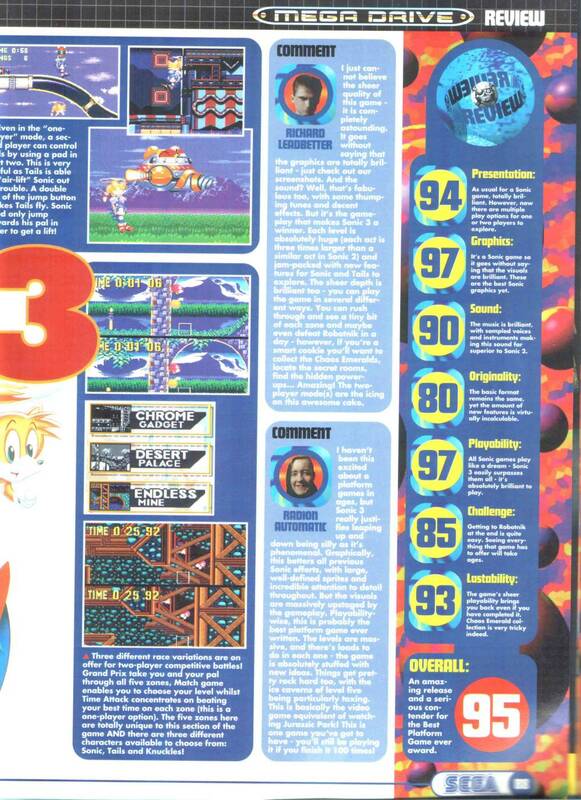 Giving it a total of 90%. 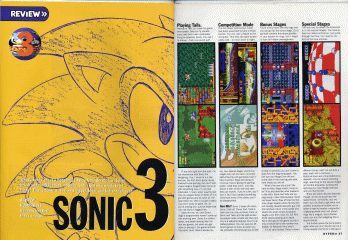 Hyper Magazine in March '94 had a review for Sonic 3 using a very odd format for it's screenshots. 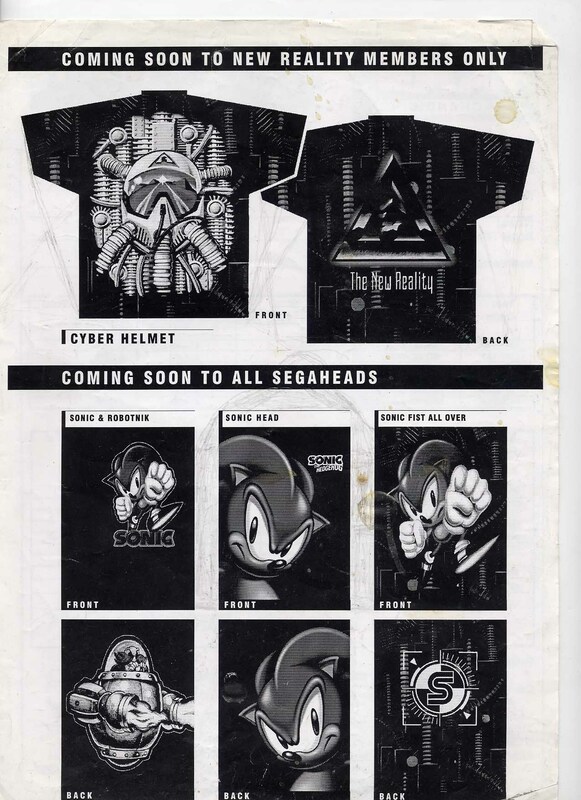 They went' through a lot of different styles during this period. 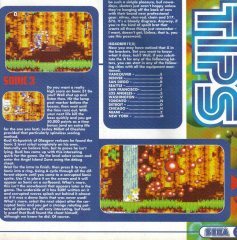 An issue of the UKs Official SEGA Magazine had this little Tips and Trick bit with some information about the Sonic Surfboard sprite. 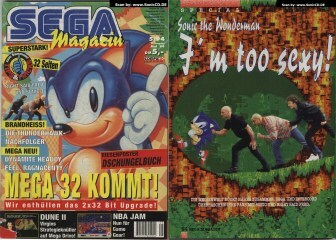 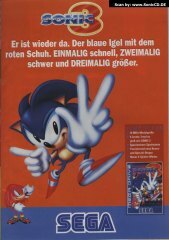 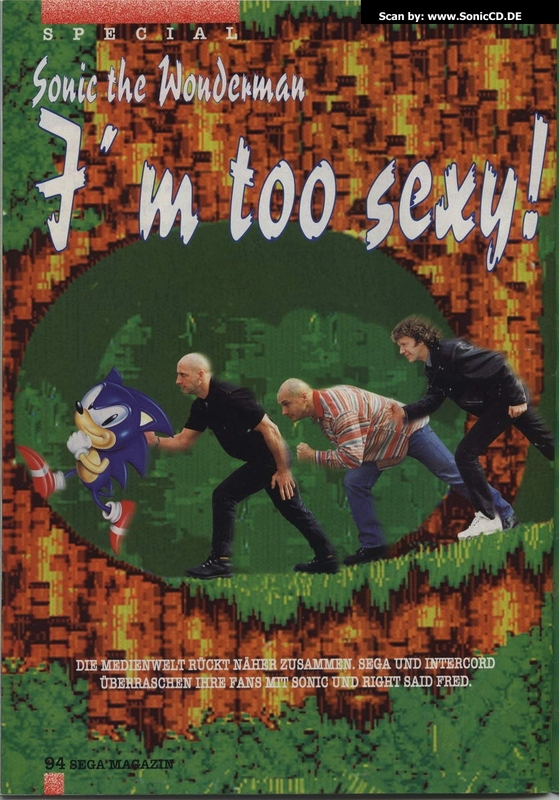 Here is a small advertisement for Sonic 3 from the German SEGA Magazin. 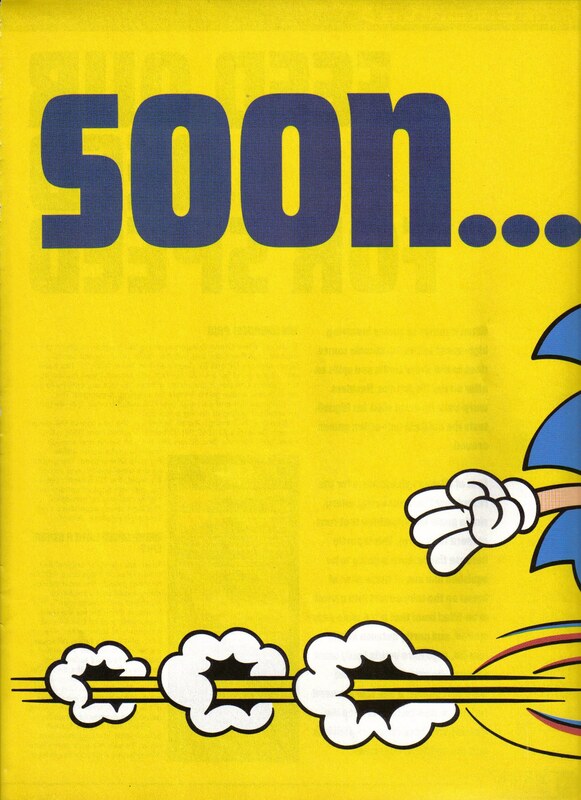 This is the first revision of a Sonic 3 advertisement in the UK, just saying 'soon'. 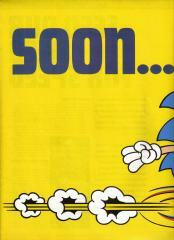 Heres the second version, now stating the date of release of the game. 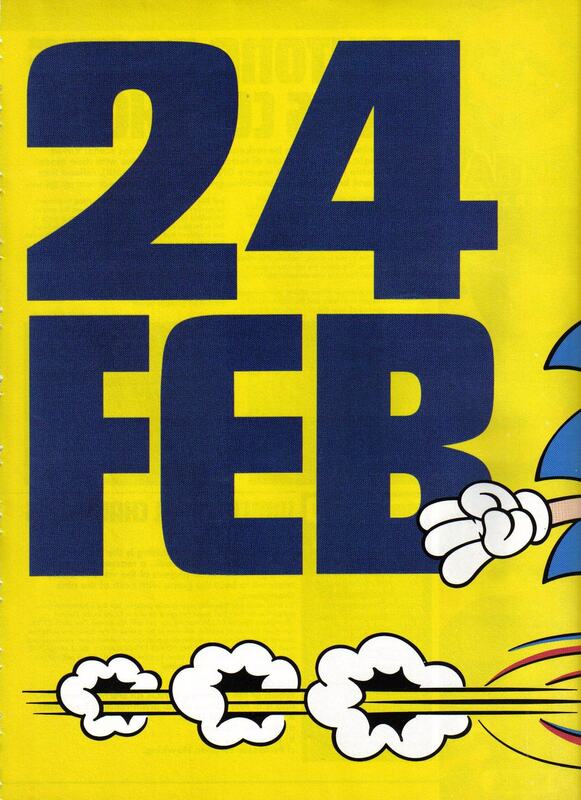 This was a quick and cheap advert by 'ARGOS' video game chain saying that Sonic 3 is now avaliable. 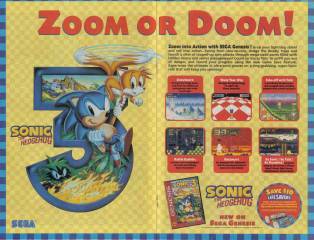 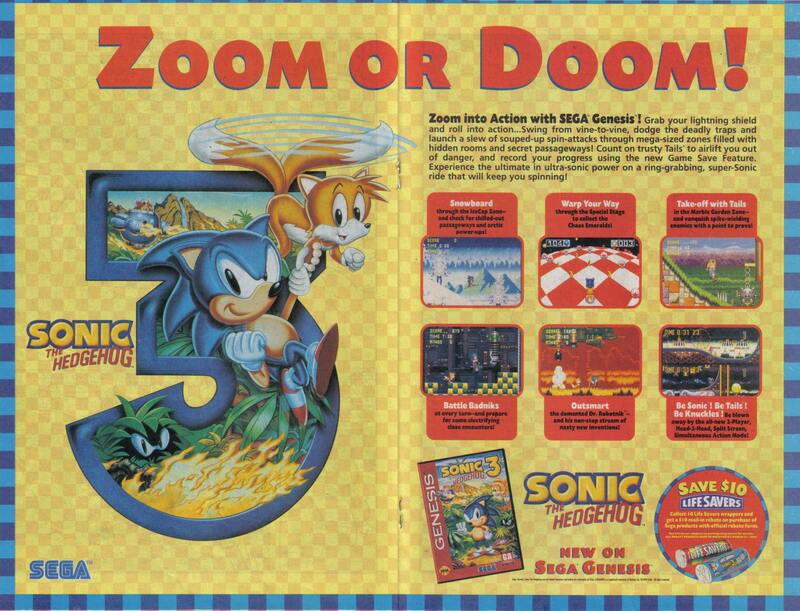 This 2 page advertisement was used in the Sonic Archie comics. 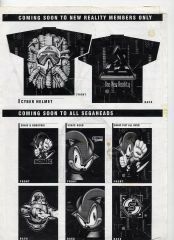 It also shows a Live Savers helper to get SEGA rebates. 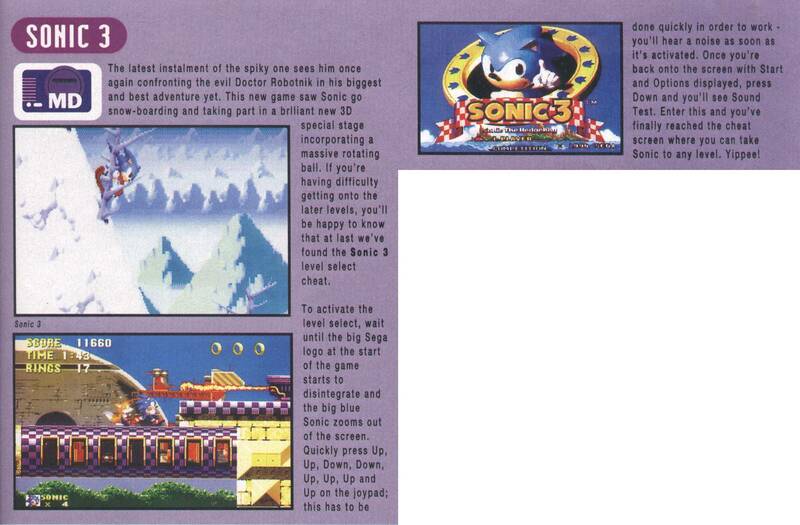 This little information leaflet was within Sonic 3 in Japan. 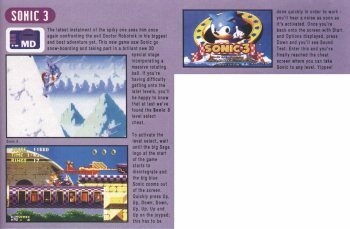 This is the digital manual of Sonic 3 from Sonic Jam, all avaliable as TIF files on the disc, they've been turned into gif forms here. 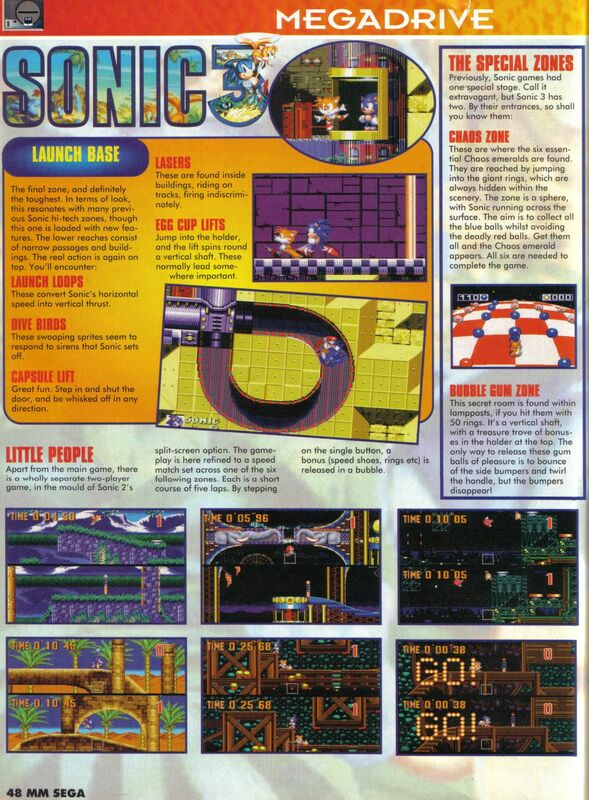 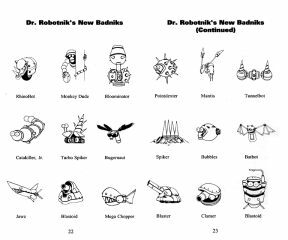 This is the digital manual of Sonic 3 US from Sonic Jam, all avaliable as TIF files on the disc, they've been turned into gif forms here.